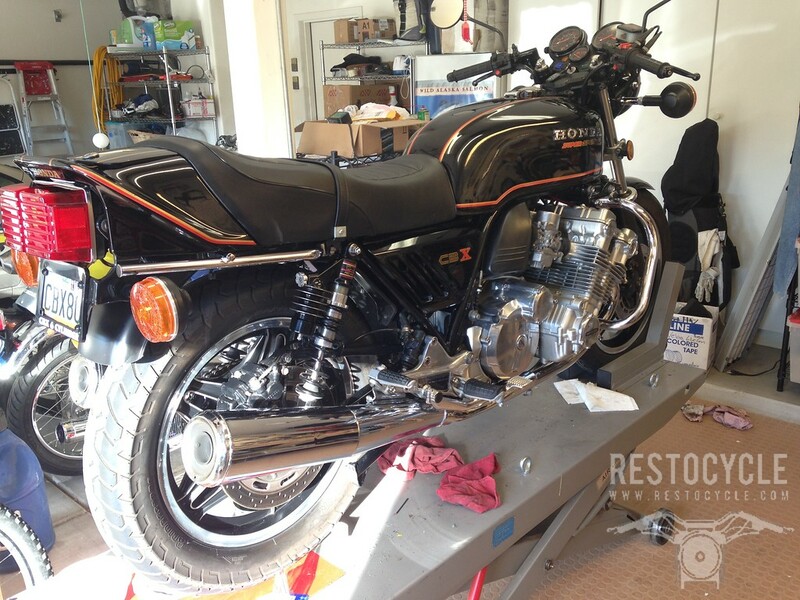 The International CBX Owners Association • View topic - What did you do to your bike today? I've seen variations of this thread on many sites, and it's a fun one, so I thought I'd give it a try here. I'll go first! NICE part, all the connectors and wire colors are correct, but it's made of modern materials, fits great, spotlessly clean. For the record the problem was NOT J.R.s excellent alternator, it was my crappy old wiring harness that had been poorly repaired, by me. Replaced the fried DieHard battery with a BigCrank battery for a GL1500, which fit nearly perfectly with the addition of a wee bit of foam. Replaced the left-side exhaust heat shield from my Delkevic exhaust, as the screw worked loose and that in turn popped the spot welds to the clamp. Had it re-spot welded and shortened a screw to fit, locktighted it in there this time. Adjusted the fit of the chain guard. Replaced the oil sump gasket and oil pump pickup screen. Wired in a relay to power the coils directly. It looks great again, had been a while since it had been shined up. FIRED THE EVIL BEAST UP (best part of all) and it sparked up and ran perfectly, and mo bettah, the alternator was correctly charging the battery, minus my funky messed up old wiring harness, and all the lights, and turn signals and whatnot worked perfectly right off the bat. Tonight it is getting its new battery topped off, and tomorrow we are going for a spin, and assuming all is well, I get to tear into my BMW and fix it's antilock brake pump next. How about you? What did you do to your bike today? Great start to a fun thread, Nils! I just went out and had a good look at my 80 X and felt that all was well in the universe for another week. Will be taking her out to first bike show with God's Squad CMC visiting a youth centre. Bet these kids have never heard of, let alone seen a CBX. The bonus is the six pipe symphony! Last edited by Michael Vidovic on Tue Feb 10, 2015 7:06 pm, edited 1 time in total. Michael Vidovic wrote: I just went out and had a good look at my 80 X BLACK BETTY and felt that all was well in the universe for another week. Will be taking her out to first bike show with God's Squad CMC visiting a youth centre. Bet these kids have never heard of, let alone seen a CBX. The bonus is the six pipe symphony! Michael Vidovic wrote: I just went out and had a good look at my 80 X and felt that all was well in the universe for another week. Will be taking her out to first bike show with God's Squad CMC visiting a youth centre. Bet these kids have never heard of, let alone seen a CBX. The bonus is the six pipe symphony! Will try but generally they take the cameras and phones off us at the entry desk. See if I can get one of the guys before we enter. Now I have to learn how to upload pics on this site!!! Last edited by Michael Vidovic on Tue Nov 04, 2014 3:23 am, edited 1 time in total. Last edited by Michael Vidovic on Sun Sep 21, 2014 11:45 pm, edited 1 time in total. It was not today but, almost 2 years ago when my CBX was filmed for a movie called "The Beautiful Ones", here is a trailer. fitted Tim's euro alternator nice and easy. refitted left side exhaust with new header gaskets sealed ok now. took cbx out on 1st ride after rebuild, all seem ok but need to address racket coming from clutch. also wont run unless fuel tap is in reserve position, plus i think it may have a leaking so a new will be orded. fasterspider wrote: It was not today but, almost 2 years ago when my CBX was filmed for a movie called "The Beautiful Ones", here is a trailer. That was an awesome clip! Don't take life too seriously, you will never get out of it alive. It wasn't today, but over the weekend I rode my 82 CBX. It was a big ride for me because my last ride was June 19 of this year. I had a bad fall fall at work and my left arm required 4 hours of major reconstructive surgery. My cast came off September 3 and I have been enduring intense Physical Therapy 3X a week since. Well, over the weekend I wrapped my arm super tight and went for a long relaxing ride on back country roads. Hurt like hell and my Therapist would take my bike away if she knew, but let me say this.....the CBX is still doing what it set out to do 32 years ago...putting a smile on the rider's face and inspiring awe in the onlookers! Having that injury with all this nice weather must have made it worse. It must be tough working on your new resto with only one wing. Fantastic Patrick, great to hear. The weather suddenly turned perfect here, peak ridding season, and I intend to get after it too. 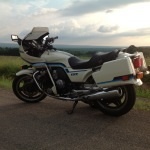 Yesterday I bolted a set of Sankei reproduction exhaust that I purchased on Ebay on to my 79 CBX. I am really impressed with the fit and finish. They look like stock and seem to be just a bit heavier than the stock pipes and they fit perfectly! I kept waiting for the hidden defect or installation problem but it never happened. Couldn't be happier with them! Spent the previous arvo searching for a gremlin that prevented the X from starting. Went through the usual checks-battery, earth, cables, switches etc. No joy. Problem was similar to one I had with my 86FXR which was solved by a new battery. I was preparing to buy a new battery for the X when my nephew rocked up and did a couple of things with the electrics which I call black magic. He deduced the starter magnetic switch was a bit suss. I had considered that but didn't pursue it the way he did. We pulled it apart and Lo and behold the contacts were gummed up. Cleaned them up, fired up like a beaut. All cool, learned something and saved $200 odd dollars on a battery. Pays to do basics and not panic-another valuable lesson in life. It's the little victories that keep you going.